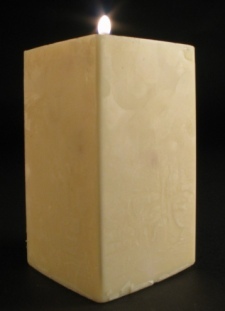 Square Pillars - 2" x 6" to 12"
Made with a natural soybean wax and cotton wick for cleaner and longer burning time. High quality oil is through the whole candle, the scent lasting for the life of the candle. Lightly brushed with gold, for a more finished look, unless you request to leave the finish off. Cotton wicks used. AVAILABLE IN UNSCENTED OR ANY SCENT LISTED BELOW. RUSH ORDER $10.00 (See Last Item This Page). If you are going to order this product and have a Special Request or Instructions please use the Notes box below. Burning time about 75 hrs. Square Pillar 2" x 9"
Square Pillar 2" x 12"
Burning time about 100 hrs. Square Pillar - 2 1/2" x 6" to 18"
Square Pillar - 3" x 6" to 12"
Burning time about 85 hours. Burning time about 125 hours. Burning time about 150 hours. 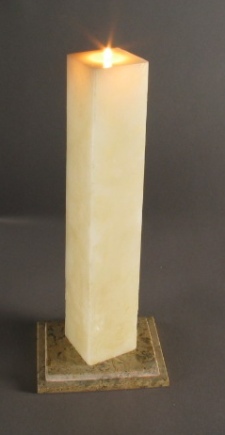 Square Pillar - 4" x 6" to 12"
Square Pillar - 5" x 6" to 12"
Ball Candles 3" to 6"
As flame goes into the ball, the whole ball glows.Made with a soybean natural wax and cotton wick, for cleaner and longer burning. 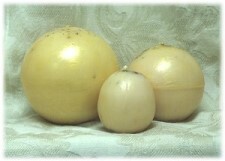 High quality oil used through the whole candle, the scent lasting for the life of the candle. Lightly brushed with gold. Cotton wicks used. Burning time about 30-35 hrs. Medium Burns about 60-65 hrs. 2lb.4 oz. Burning about 150-200 hrs. Burning time about 2 hrs.